This slow cooker recipe reminds me a little bit of a past trip to Budapest, or what I remember of Budapest, which is the food of course. Most of the dishes I consumed were meat and potatoes with various sauces, many with paprika and mustard. Always with lots of red wine, which gave me nasty hangovers and cravings for more rich and saucy meat and potato dishes. Slow Cooker Pork Chops in Dijon Paprika Sauce Print Recipe. Jesse liked this meal so well he ate his portion and the extra one too. 1. Grease the slow cooker with light colored oil. Scrub the potatoes and place them snuggled together in a large oval slow cooker. 2. In a bowl, mix together soup, sherry, Dijon, garlic, thyme, paprika and pepper. Pour mixture over potatoes. 3. In a large skillet, melt the butter until the foam subsides over high heat. Gently add the pork chops and season with salt and pepper. Sear both sides. 4. Place pork chops on top of the potatoes. Scrape pan drippings into the slow cooker. 5. Cover and cook on low heat for 7 to 8 hours or on high for 3 1/2. Plate and spoon sauce over potatoes and pork chops. Season with salt and pepper before serving. 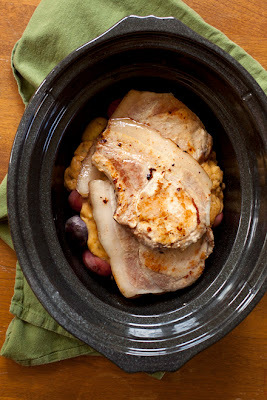 I've been in the mood for pork chops lately... glad to have another yummy recipe for them! I'm thinking the red wine was some kind of entrepreneurial tactic to get you to keep coming back. :P I understand, though...this looks GOOD. Definite fall comfort food. Sounds divine! Do you have a suggestion for a non-alcoholic substitution for the sherry? It won't be quite the same, but try adding two tablespoons of white vinegar and some extra salt.